Although spring is now well underway in the middlin’ latitudes of Missouri, it was only a few short weeks ago that winter was still with us. 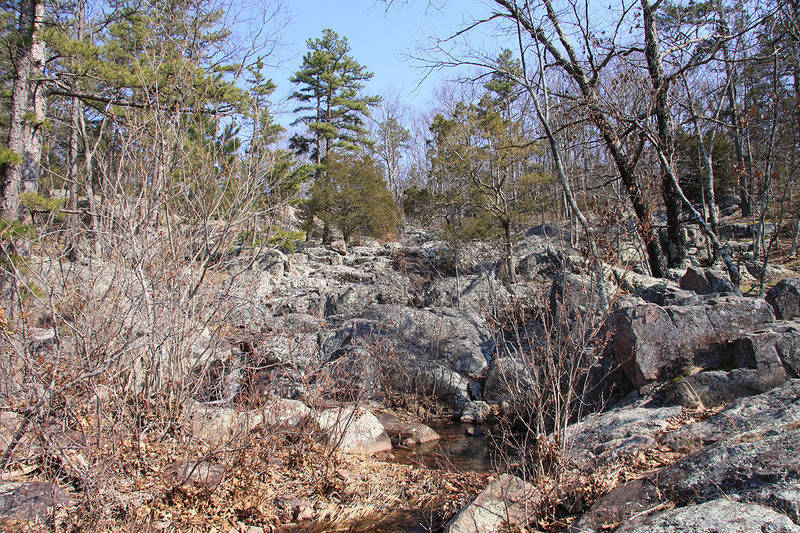 For my last winter hike of the season, I returned to perhaps my favorite stretch of my favorite trail in all of Missouri – the Mina Sauk portion of the Taum Sauk Trail on Taum Sauk Mountain. 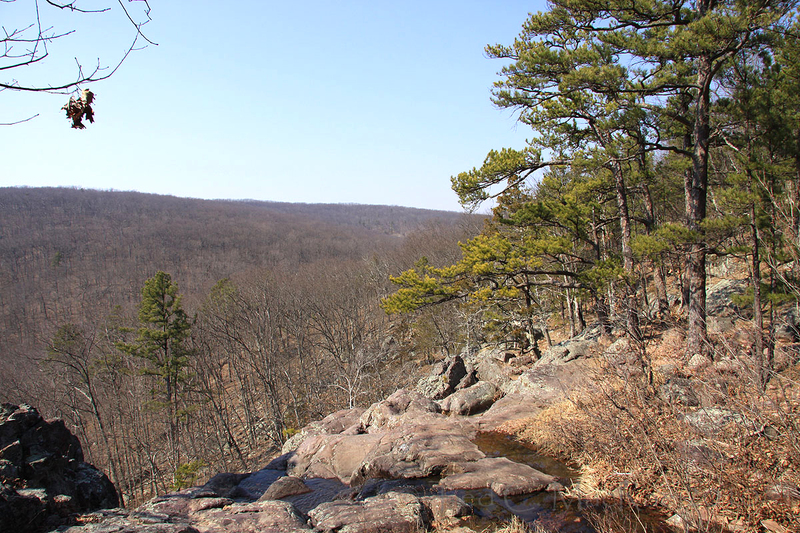 Located in the rugged St. Francois Mountains (the “epicenter” of the Ozark Highlands), Taum Sauk Mountain is Missouri’s highest peak. I say “peak” with a bit of reservation – at 1,772 feet it hardly compares with the high peaks of the Rocky Mountains or even the much mellower Appalachians (and certainly not with those of my beloved Sierra Nevada). Nevertheless, unlike the remainder of the Ozark Highlands, the St. Francois Mountains are true mountains initially formed through a series of volcanic events occurring well over a billion years ago. They, and the rest of the Ozark Highlands, have been shaped to their current form by repeated cycles of uplift and subsequent erosion. During their Precambrian prime, the St. Francois Mountains reached heights of 15,000 feet (the “ancient” Appalachians, in the meantime, were still just a twinkle in Mother Earth’s eye). Rain and wind and the vastness of time have reduced them to nubs, leaving only the most ancient of volcanic rocks as testament to their former glory. Although most of what is now the Ozark Highlands was inundated repeatedly later in the Palaeozoic (laying down the sediments that were then uplifted and “carved” to their current shape), the highest peaks of the St. Francois Mountains may be among the few areas in the United States never to have been completely submerged under those ancient seas. Standing atop Taum Sauk Mountain, it is tempting to visualize today’s craggy terrain as a fossil of that ancient landscape – the peaks representing the former islands of rhyolite, their slopes barren and lifeless in stark contrast with the exploding diversity of bizarre life forms appearing in the tropical waters that surrounded them. The sterile, volcanic rocks of the St. Francois Mountains support an abundance of open, rocky glades – especially on their peaks and southern and western slopes – that are home to a number of plants and animals more typically found in the tallgrass prairies further west. Indian grass (Sorghastrum nutans) and little bluestem (Schizachyrium scoparium) thrive in clumps between the large, pink boulders that are strewn across the landscape and which provide shelter and sunning spots for animals ranging from the charismatic eastern collared lizard (Crotaphytus collaris) to the smaller but no less beautiful splendid tiger beetle (Cicindela splendida). The surrounding forest is historically an open woodland with a rich, herbaceous understory and widely-spaced, drought-tolerant trees such as shagbark hickory (Carya ovata), post oak (Quercus stellata), and blackjack oak (Quercus marilandica). These woodlands and glades are a fire-mediated landscape dependent upon periodic burns to maintain their vegetative character. 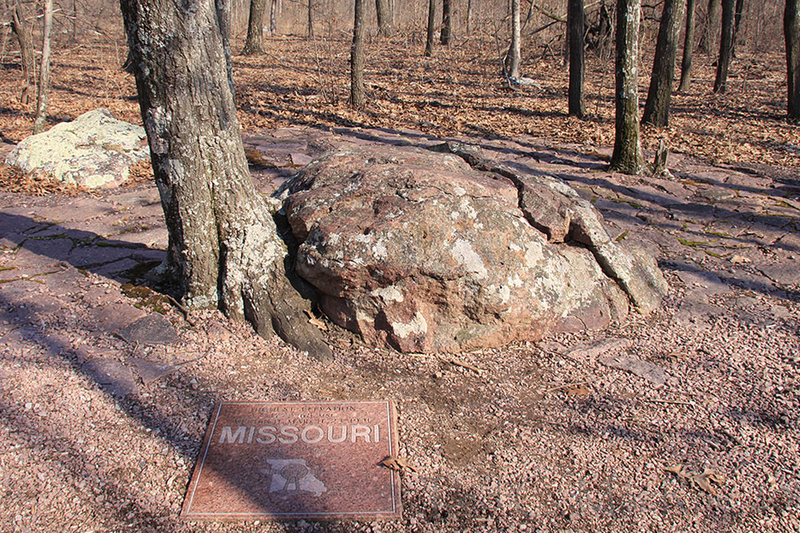 A trail begins at “High Point”, marking the summit of Taum Sauk Mountain and the highest point in Missouri. A granite slab next to the summit rock documents the elevation at 1,772.68 feet MSL (Mean Sea Level). The Mina Sauk Falls Trail, a rugged three-mile loop that joins the Taum Sauk Section of the Ozark Trail, leads to the tallest wet-weather waterfall in Missouri, Mina Sauk Falls. During periods of high water flow, water gushes over the edge and drops 132 feet over a series of rocky ledges. Water was flowing lightly during my late winter visit; nevertheless, looking out from above the falls (see photo above) offers one of the most spectacular vistas available in Missouri. A rather difficult hike down the side of the mountain to the bottom of the falls is also well worth the effort, although clear views of the entire falls are difficult to find in the dense, moist forest below (it was here that I photographed the spectacular Ozark Witch Hazel). 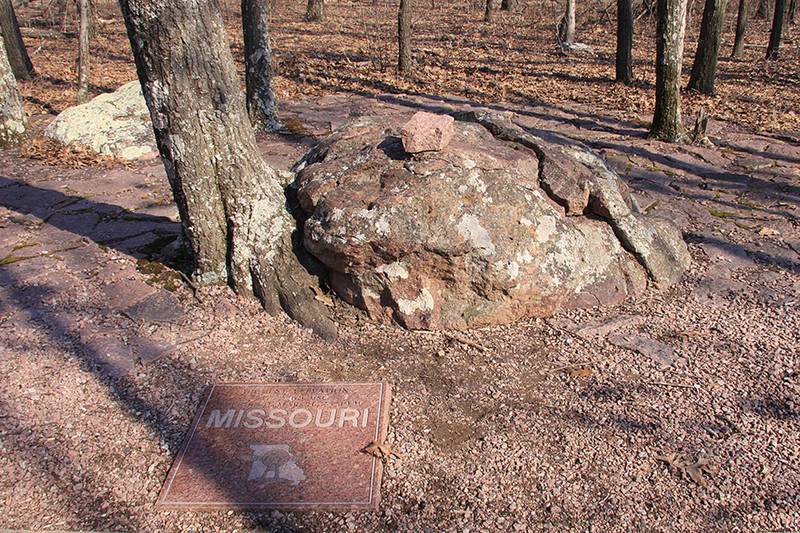 A second unique geological feature lies about a mile farther down the Ozark Trail – Devil’s Toll Gate. The rocks stand 30 feet high on either side of this eight-foot-wide, 50-foot-long fissure. The gap probably began as a vertical fracture in the rock that has been enlarged by subsequent weathering. Over time the fissure will continue to widen, as the rocks on either side lose height. Returning to High Point at the end of the hike, I noticed that the summit was a little higher than when I started my hike – whether this was through additional uplift of the underlying mountain or a depositional event I cannot say. Nevertheless, I estimated Missouri’s new highest elevation to be approximately 1,773.01 feet MSL! This entry was posted in [No taxon] and tagged ecology, geology, glades, Hiking, landscapes, Missouri, Ozark Trail, Ozarks, science. Bookmark the permalink. Cool read, and sounds like an awesome place to visit! Thanks, Morgan – it’s one of my favorite places in all of Missouri. The Devil’s Toll Gate is a really interesting feature. I’m a sucker for interesting rock formations. I want to go there and find some relic Cretaceous ant that looks like a beetle when viewed curled up and upside down! Looks like a great hike, Ted, and the Devil’s Toll Gate is rather cool. I’m tickled by your reservation to call Taum Sauk Mountain a peak. From the flatland prairie where I live, it might as well be Mt. Kilimanjaro. Hi Jason. 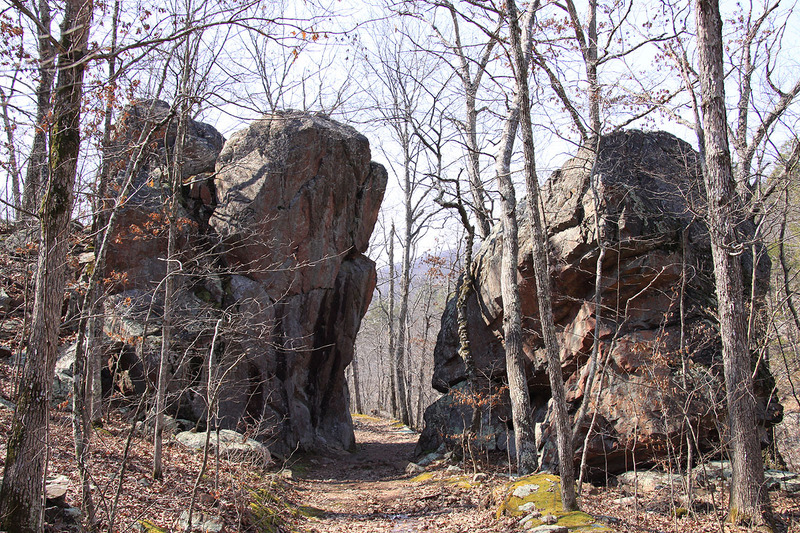 There are a handful of trails in the state that I would put on my “greatest hits” list for Missouri – this is one of them! Hmm, I guess my “additional uplift…or a depositional event” joke was either a little too subtle or just plain dumb!